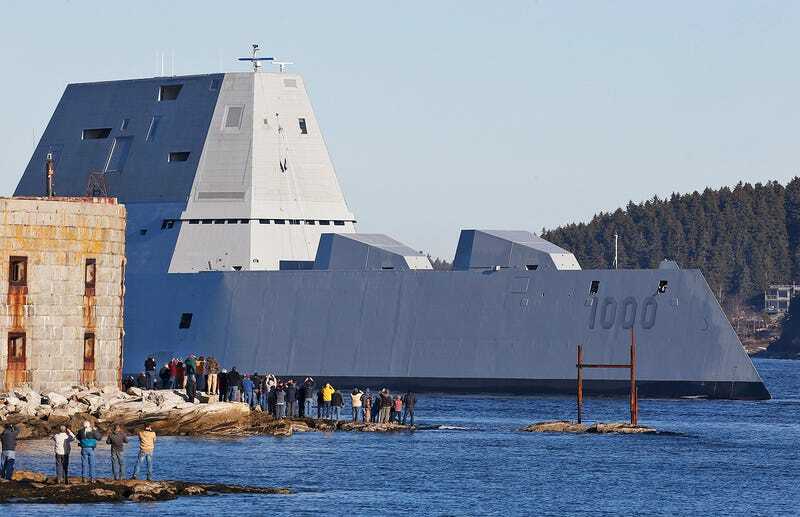 The Navy’s new stealthy super-destroyer, the soon to be named USS Zumwalt (DDG-1000), already has something to be proud of, even though it just left port on its first set of sea trials last week. Early Saturday morning the intimidating-looking surface combatant assisted in a rescue operation of a nearby fishing boat skipper that fell gravely ill. According to the Portland Press Herald, the distress call came in to the Coast Guard at 3 a.m. Saturday morning reporting the fishing boat Danny Boy’s captain was suffering severe chest paints some 40 miles southeast of Portland, Maine. A Coast Guard MH-60 Jayhawk from Air Station Cape Cod was dispatched to the scene in an attempt to medevac of the captain. Once the chopper arrived, the crew decided that it would be too dangerous to winch the patient from the tiny deck of Danny Boy. They had to come up with another game plan, and fast. Coast Guard Sector Northern New England issued a emergency request to nearby vessels in hopes that ship-to-ship transfer could occur, with the helicopter crew lifting the captain aboard from a ship with a larger, less cluttered deck space. They got what they asked for and more. The nearby DDG-1000 answered the distress call, launching a small boat team to the retrieve the stricken captain. After arriving onboard the new warship, the Coast Guard Jayhawk would attempt to winch him aboard via the Zumwalt’s expansive 7,650 square foot flightdeck. The plan worked perfectly, with the Captain making his way to Maine Medical Center in time to get treatment.